I stepped outside the kitchen this morning to catch this shot; it is surely a reflection of my present state of mind. The plaster party goes on in the background but this week there will be a Solstice celebration, Christmas with the family, huge waves of joy and sorrow as all the memories of past holiday seasons flood in. I dreamed I was standing on a rock with rising water all around me. I put my hands over my eyes. I woke up. I feel your hand, my Friend. You are surely not alone. Big strong love going back and forth... May the light of the Solstice fill you up ! 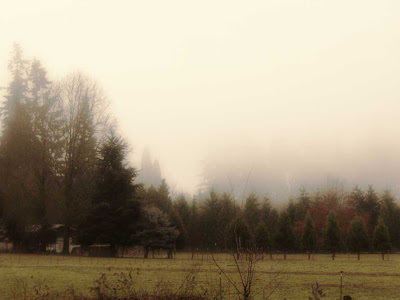 All the beautiful trees make up for the fog. It must be really pretty there on a clear day. Ok, I just could not take it anymore I love your artwork, so I decided to step out of my box. I whinned to Glenny and she let me switch into your journaling class in Las Vegas. I read your new book Creativetime and Space,it was great. See you in Vegas. Ok! sorry about the mistake a guess Creative Time and Space Is Not Your book but I still love it. It IS as if we are all in a huge circle holding hands! Both of mine are in the circle too, giving and receiving! I read Rice's books too and it was wonderful learning from some of your creative wisdom. Thank you for your generosity of spirit and all that you share here. I look forward to every post! I hope you are able to keep a peaceful mind amongst all the emotional Christmas turbulence. Judy, your foggy scene is so lovely. I'm glad you went out to capture it with your camera. And yes, lots of mixed emotions in this season of heightened spirits...some so good it hurts and some so sad, well that hurts too. Nice to know we all hold hands in this inner circle and hold each other up. I really do feel that here. Thanks for putting yours out there. Very heart warming, I guess this foggy feeling remains with us most days and its nice to have a hand or two to hold on to. a cloak of warmth and ride out the storm. For me this is always a time of loss, for those who are no longer with us even as it is a celebration of family and what is to come as we nurture that kernel in the darkness until Spring. Blessings to you gentle soul in this holiday season. It makes me feel isolated. I lost my dad in September, the holidays will never be the same... I do need a hand to hold. Lovely thought ... lovely photo. Thank you for keeping the circle going. I saw your wonderful, haunting almost, photo and read your post and the first thing that popped into my head was the song "The Times They are a Changing" by Bob Dylan. That's how my head and my heart is feeling this season. So I reach my hands out to you and the rest of the community here for some reassurance that goes both ways. What a beautiful post Judy. I love the thought of an inner net and all of us holding hands. Your post meant a lot to me at this time as I am having a wave of emotions. Lots of tears. judy babydoll, that golden net you cast out into the waters for all of us is a dear and precious thing. It has been so foggy, hasn't it? We drove in and out of it last night. Thanks for the recommendation to hold hands. We can all use that bit of support so we don't take any tumbles. Judy- I love the image and your words. You are right in that some of us struggle to understand the waves of emotions we feel at this time of year. Thanks-I'll also be holding your hand for this one. Inner net....love that...and here we are all standing together, holding hands across time and space, weaving the web of love and support that keeps us all from hitting the hard ground when the tightrope disappears from our toe-grip. Right hand up, left hand down...giving, receiving. Perfect idea. Love it. Hope you have a wonderful holiday, sweet one. Thank you. Your post is beautiful and really does make me feel better, stronger through these emotions...Happy New Year to you! Hi Judy My name is Sandra and I feel you have really touched me.I read your story in Art Doll and I so feel the same way. I mad a doll in school at ayoung age ad have never forgotten her. I too am an artaholic!!!!! I have looked at you blog and got a real lump in my throt looking at the pics. I too amstanding on the rock with you. I lost my dad last year in Mar. and this holiday season has been very nice but sad. I really mis him. I am so glad I read about you as it ha touched me deeply. Thank you Judy.